Showcase unit and lamp for house, showroom and public areas. The particular and sophisticated manufacturing process of the curved glass creates a unique lens effect, emphasized by the use of integrated light. A dedicated system allows the shelves to be fixed to the vertical column, placing them at the desired height and each shelf is provided with adjustable Led lighting. A powerful lamp with Led technology is placed at the top of the vertical column to light the space. 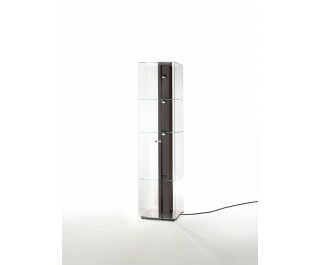 The door, the back, the shelves and the top are in 6 mm thick transparent extralight glass, the column and the base cover are in anodized aluminium dark brown or inox. Available with or without lock.